James Ferrara opened the scoring for Phantoms in Bracknell. The city men roared to a 7-4 victory in Bracknell in the first leg of a silverware showdown which continues at Planet Ice tonight (April 7) when Slava Koulikov’s stars will be hot favourites to complete an honours treble for only the second time in club history. 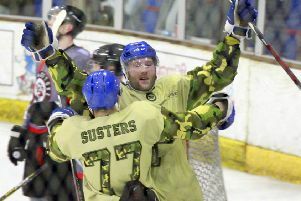 Ales Padelek scored twice for Phantoms in Bracknell. Phantoms struck three times in the opening period to gain the upper hand and stretched their advantage to 5-0 at one stage of the middle stanza during an accomplished away performance as they aim to add to a collection of honours already featuring the NIHL Autumn Cup and NIHL South Cup. “We wanted to make sure we brought the tie home with a chance of winning and we have more than done that,” said Koulikov. “The guys executed the tactics superbly and it was a terrific team effort against a team who always battle hard in their building. “We lost two of our three games in Bracknell in the regular season and were also behind after two periods in the second leg of the cup semi-final. Captain James Ferrara fired Phantoms into an early lead before powerplay strikes from Glenn Billing and Martins Susters gave them a three-goal cushion at the end of the opening period. And that advantage increased further in the middle session thanks to goals from Nathan Pollard and Ales Padelek, which arrived less than 90 seconds apart, before Stuart Mogg put Brackell on the board with a powerplay effort. Petr Stepanek hit a sixth Phantoms goal only 55 seconds later with Bees import Roman Malinik then striking before Josh Martin added a third for Bracknell in the early stages of the final period. Two rival imports then hit their second goals of the evening with Padelek completing Phantoms’ haul before Malinik gave the Bees slightly more hope inside the final minute. But it is Phantoms who will hit their own Bretton ice tonight (5.30pm) in pole position to capture the play-off crown and Koulikov has called on the club’s fans to create a white-hot atmosphere on what promises to be another famous occasion. He added: “It would be a dream come true for everyone involved in the Phantoms organisation to win a third piece of silverware. “We’ve already been lucky enough to lit two trophies in front of our fans this season and hopefully we can celebrate again.